It's 2013. The world is changing rapidly, and mostly for the better. So the least (and I do mean the very least) we can do for the womenfolk, I suppose, is to appreciate it when they show that they are just as capable of having a thoroughly enjoyable and thoroughly foul-mouthed buddy cop comedy as the long line of men who have done it before them. Director Paul Feig is going to make women's lib at the box office his calling card if he isn't careful. Feig directed 2011's Bridesmaids, a film that established the likes of Kristen Wiig and Melissa McCarthy as comedic forces alongside their male counterparts. And he calls upon McCarthy again in The Heat, giving her a lead role (as opposed to her unforgettable supporting turn in Bridesmaids), teaming her with Sandra Bullock as the pair try to take down a drug syndicate in Boston. Lest I be accused of giving a no-good man all the credit, it should be pointed out at this stage that women were behind the scripts for both Bridesmaids and The Heat, with Katie Dippold, a writer for the great NBC comedy Parks and Recreation, providing the screenplay in the case of the latter. Feig and Dippold stuck to convention in the crafting of this tale, seemingly by design. Bullock plays Sarah Ashburn, an uptight FBI agent who likes to play strictly by the rules and as a result doesn't make many friends. McCarthy meanwhile is Boston Police Department detective Shannon Mullins, a brash lone-wolf type who defers to no one on pretty much anything, especially her squad captain, played by none other than Tom Wilson (aka Biff Tannen from the Back to the Future films). Their contrasting styles and disputes over jurisdiction cause conflict at first, but a bond eventually develops because, well, they're both tenacious crimestoppers who ultimately want the same thing -- for the bad guys to get put away. By hewing to convention in many ways but also allowing their ostensibly female characters to do things in their own manner (rather than just the way a man would), Feig and Dippold strike the perfect balance. McCarthy and Bullock are able to prove that they can be just as funny as, say, Will Ferrell and Mark Wahlberg were in The Other Guys but not simply by following a trail their male doppelgangers have already blazed. This is how it should be, right? 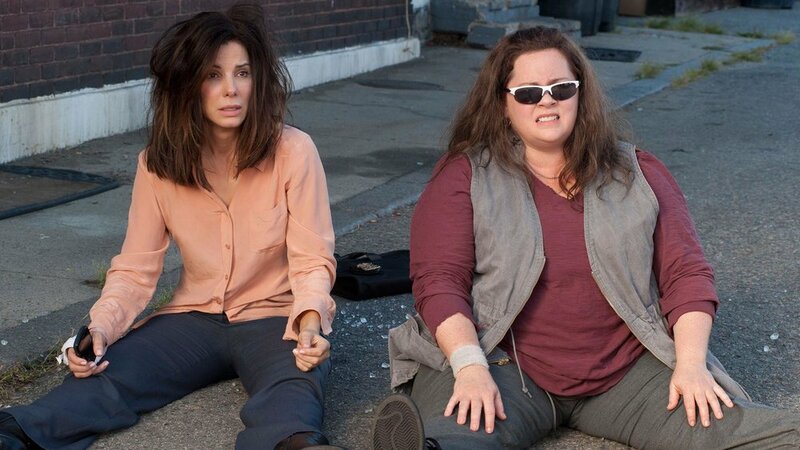 McCarthy, who so clearly has more range than she showed in Bridesmaids or the lamentable Identity Thief, and the fabulously talented Bullock, who really should do comedy more often, are given plenty of room to work their magic in The Heat, and they work it with aplomb. They have plenty of help along the way. Bit parts for Kaitlin Olson, Marlon Wayans, Jane Curtin, Michael Rappaport, Dan Bakkedahl (!) and Taran Killam ensure that the laughs aren't monopolized by the two stars. That extra texture adds quality. About the only thing that detracts from it is the run-time of 117 minutes, an egregious length for a comedy that would be more annoying were it not a borderline epidemic in the genre at this point. I can't complain too heartily about a little too much of a good thing, though. The Heat certainly qualifies for that designation.